The VA2213 is a cost-effective filter-less Class D stereo audio power amplifier that operates in wide range of various power supplies. VA2213 provide volume control with four selectable gain settings (20dB, 26dB, 32dB, 36dB). VA2213 can output 15W per channel into 8Ω load with lower supply current and fewer external components for driving bridged-tied stereo speaker directly. With the function of power limit, the speakers could be operated safely and the input signal would be also normalized. VA2213 operates with high efficiency energy con- version up to 88% (8Ω Load) so that the external heat sink can be eliminated while playing music. VA2213 also integrates Anti-Pop, Output Short & Over-Heat Protection Circuitry to ensure device re- liability. This device also provides the DC detect and protection scheme to prevent the damage of speaker voice coils. The VA2213 is available in small TSSOP-28 green package with exposed pad. can be set to auto-recovery. Otherwise need to reset by cycling AVDD. 3 LINP I Left channel positive audio signal input. 4 LINN I Left channel negative audio signal input. 5 GAIN0 I Gain selection least significant bit. 6 GAIN1 I Gain selection most significant bit. 7 AVDD P Analog Power Supply. 8 AGND P Analog Ground. 9 VREG O Regulated Voltage. Nominal voltage is 5.5V. to set power limit. Connect to VREG directly for no power limit. 11 RINN I Right channel negative audio signal input. 12 RINP I Right channel positive audio signal input. LOW = outputs enabled). TTL logic levels with compliance to AVDD. 14 PBTL I Parallel BTL mode switch. 15,16 PVDDR P Right channel power supply. 17 BSPR I Bootstrap I/O for right channel positive high-side switch. 18 ROUTP O Right channel positive output. 19 PVSSR P Right channel power ground. 20 ROUTN O Right channel negative output. 21 BSNR I Bootstrap I/O for right channel negative high-side switch. 22 BSNL I Bootstrap I/O for left channel negative high-side switch. 23 LOUTN O Left channel negative output. 24 PVSSL P Left channel power ground. 25 LOUTP O Left channel positive output. 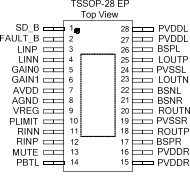 26 BSPL O Bootstrap I/O for left channel positive high-side switch. 27,28 PVDDL P Left channel power supply. ( *1): Stress beyond those listed at “absolute maximum rating” table may cause permanent damage to the device. These are stress rating ONLY. For functional operation are strongly recommend follow up “recommended operation conditions” table. Over operating free-air temperature range, unless otherwise specified. TA = 25℃, VDD = 12V, RL=8Ω, GAIN=20dB, unless otherwise noted. TA = 25℃, VDD = 24V, RL=8Ω, GAIN=20dB, unless otherwise noted.